Tip! Fire Extinguisher Tips and Preparedness! A Fire Extinguisher is an invaluable addition to any home. Here we discuss what you should look for and what you should do! Fire Extinguishers…What You Need to Know! At Disaster Blaster, we often deal with Smoke and Fire Clean-Up and Restoration. Many of these disasters could have been minimized or avoided altogether if the homeowner had a fire extinguisher. Fire extinguishers are a common safety item, but are sometimes overlooked. From choosing the right extinguisher to the correct application, Disaster Blaster would like to help answer some common questions associated with fire extinguishers and their use. The first step in proper fire safety is choosing the right equipment for the job. There are three types of residential fire extinguishers. They are categorized as A, B, and C (D and E are used in commercial buildings and aren't covered in this article). 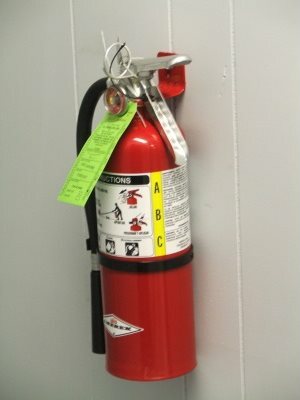 Fire extinguishers can encompass multiple categories such as an AB or ABC extinguisher. The A category fights ordinary combustibles, such as wood, paper, plastics, and regular trash items. 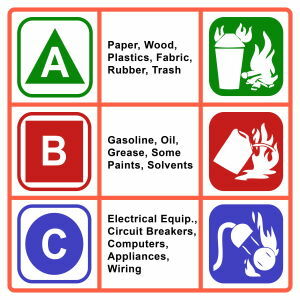 Category B is effective on flammable liquids including cooking oil, gasoline, and paint thinners. And finally, category C extinguishers are intended specifically for electrical fires, as the chemical contents are not a conductor of electricity. Choose your fire extinguisher with these categories in mind. If you are buying an extinguisher for the garage, a category A is probably not going to be sufficient. With fire extinguishers, while bigger is better, there are several sizes to choose from and their uses are different. A small 2lb extinguisher is perfect for the car and can be stored in the trunk with mounting hardware. The kitchen and laundry room should have a 5lb extinguisher in an accessible place. A 10lb extinguisher meanwhile is ideal for the garage. The most important thing to remember when picking out the size of the extinguisher however, is maneuverability and ease in operation. If it is too heavy to operate, then it will be ineffective. There are currently rechargeable and disposable extinguishers on the market. The disposable models are slightly less expensive, have plastic valves, and once the pin is pulled, it must be discarded. The rechargeable models have metal valves and once discharged, it needs to be refilled. They are more expensive but, can be more economical and more eco-friendly, since the used canister is not going into the landfill. All extinguishers have a limited shelf-life so, no matter which one you choose, make sure you check the pressure gauge and either dispose or recharge them once the pressure gauge is in the red. Now that you have found the extinguisher that fits the correct category and size you need, and decided on rechargeable or disposable, it is time to place it in your home. While this seems like a simple thing, it should take some thought. The extinguisher should be mounted or stored in the exit of a room. The placement of the extinguisher should give you an exit while you fight the flames. There should also be an extinguisher on every floor of your home, and particularly in places where the potential for fire is greatest, such as Kitchen's, Laundry Rooms, Basements, and Garages. Also, ensure that the extinguisher is easily accessible and not blocked by furniture or other objects. It is important to remember to periodically inspect your fire extinguishers because they become useless if the pressure gets low or the chemicals in the canister harden. The compression gas can leak and cause low pressure over time, so be sure to check your pressure gauges to ensure that they are within acceptable levels. There is an expiration date on extinguishers and should be adhered to. Tip: Inspect your fire extinguisher when you test your smoke detector batteries. Once the fire extinguisher is 6 years old, or has been discharged, it is necessary to have the extinguisher properly serviced by a professional. During this maintenance, they will empty, refill and pressurize the tank, and replace fittings and nozzles so that the extinguisher will operate optimally should you ever need it. After 12 years, the fire extinguisher now must by hydro-tested, which involves the unit being emptied, filled with water, and pressurized to ensure that there aren't any leaks or weak spots. Once the unit passes this pressure test, the fittings and nozzles are replaced, it is refilled, and pressurized. At 12 years old, a fire extinguisher can begin to show signs of stress, making this check incredibly important. Please note that the experts recommend that everyone get hands-on training before using a fire extinguisher and they are usually offered at local fire departments. Also, make sure to read the instructions that accompany the extinguisher after purchasing it and before you may need it. All fire extinguishers are similar and fairly easy to use. After making sure your back is to the exit and you have an escape route, pull the pin at the top of the extinguisher which will unlock the device. Aim the nozzle at the base of the fire and remember you are not putting out the flames but the substance that is causing the flames. Slowly, squeeze the lever to spray the fire retardant. Continue to squeeze the lever, once released, it will stop spraying. Use a sweeping motion to extinguish the fire, move the fire extinguisher back and forth standing at a safe distance. Once the flames are under control, move closer to the fire and continue to spray the retardant until all the flames are out. Fires can reignite, so do not immediately walk away, stay close until you know that there is no more danger. • In case of an emergency, 911 should be called. • Recharge or replace your extinguisher after use. • You should make sure all family members are aware of several escape routes out of the house and where you should all meet outside once you are safe. • Stage periodic fire drills with your family. House fires can be devastating but, with the proper use and maintenance of your household fire extinguishers, fire damage can be minimal. At Disaster Blaster, we are experts in restoring your home after a fire or any other disaster. If you have a need for fire clean-up or any of our services, please Call Our Office and we will be happy to assist you.